Currently, 17 states in the U.S. require safety inspections. If you reside in one of these states, it is important to know what they are looking for prior to the inspection. The list below will highlight the common items that are checked during an inspection. It is highly recommended that this inspection is performed by a reputable shop such as Creech Imports. Lights– This may seem obvious, but all of your exterior lights should be working. Also, there should be no damage to any of the lenses. If your headlight lenses are heavily oxidized, the problem should be corrected prior to the inspection. Poor or no lighting is a major factor in many accidents. Brakes– Typically, you will hear or feel when your vehicle has a brake problem, but it is a good idea to inspect them at specific intervals to prevent expensive damage or failure. The wheels should be removed to check for sufficient brake pad or shoe lining. The rotors and drums should be inspected for warpage, deep grooves, wear, or any other damage. The brake lines and hoses should also be checked for cracks or abnormalities. There should be absolutely no leaks in the system. The master cylinder reservoir should be adequately filled, and the fluid should not be discolored. Check the brake pedal for firmness. It should not push down too close to the floor. The parking brake should catch approximately at mid-travel and hold the vehicle in place on an incline. Steering– While turning the wheel from side to side, there should be no lag, looseness, or noises from the system. The power steering reservoir should be filled, and the fluid should not be discolored. If your system has a belt, it should be free of cracks, breaks, wear or other problems. While driving the vehicle, the steering should be responsive, and the wheel should stay centered when driving on a straight smooth road. There should be no leaks in the system. Suspension– The suspension should be stable and noise free at all times. It also should have precise handling. While driving, the vehicle should not continuously bounce up and down on bumpy or smooth roads. While parked, push down on the vehicle in the front and back. It should quickly bounce back up once and stabilize. Multiple bounces indicate a possible problem with the shocks or struts. The vehicle should also be raised to inspect the suspension components for any torn boots, worn bushings, looseness, or any other damage. Fuel System– If the vehicle is running well and doesn’t have a check engine light, the fuel system should be in good shape. It is important to clean the fuel system regularly to prevent problems. If you smell fuel, check the gas cap and all the fuel lines to ensure there are no leaks. Sometimes faulty emissions systems can cause fuel smells. Typically if this is the case, the check engine light will illuminate. Tires and Wheels– The tires should not have any breaks, cracks, bubbles, dry rotting, or any other abnormalities. The tread should also be sufficient and evenly worn. The wheels should not be bent, corroded, or cracked. Horn– The horn should be functional. If not, it will have to be repaired prior to the inspection. It may not always seem like it, but the horn is an important safety item. Windshield/Windows/Doors– All of the glass should be free of cracks, breaks, or any damage that would reduce visibility. The windows and door locks should work properly. The doors should also properly open and stay closed. Seats/Seatbelts/Airbags– The seats should be in adequate condition and securely mounted to the floor. The seatbelts should work and have no damage. If equipped, the airbag light should go out after startup. Floor– The floor of the vehicle should not have any holes in it. Emissions Systems– The emissions system components should be all installed and functioning properly. The check engine light will indicate if there is a problem in the system. Engine Compartment/Undercar- There should be no major leaks of any kind under the hood or beneath the vehicle. 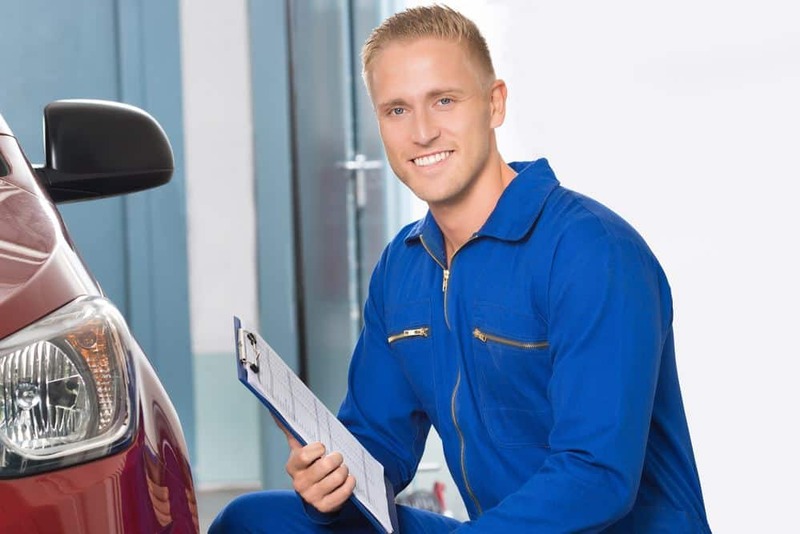 For more specific safety inspection guidelines for your area, check with your local mechanic or motor vehicle department.